Have you heard about this thing called #FeedTheDeed? It's this -dare I say- movement that these two guys from Toronto started a little while ago with the sole purpose of doing good in the world. 2. Share it on Facebook, Instagram, Twitter, or whatever else the cool kids are using these days. 3. Nominate other people to do something good. For days, I watched as my friends on Facebook dropped off dinners, visited great-grandparents, shoveled snow, and brought baked goods to firemen. As I scrolled down the page and my eyes filled with tears, I felt like my engines were revved and ready to go; all I needed was my nomination. I guess I could've just do a good deed without being nominated (which I imagine a lot of us do everyday without even realizing it) but there is just a different feeling when you see your name attached to someone's story. It feels good, special, to be part of something that's bigger than you. And to know that because of your contribution, it's getting even bigger. I know I'm not the only one who feels this way. A few years ago, I read Start Something That Matters by Blake Mycoskie (the guy who started Toms Shoes) a book about how you can "love your work, work for what you love, and change the world-all at the same time." He said that he learned early on that people are more compassionate and empathetic when there's a "story" involved; more specifically, a story in which they can play a role, like Toms shoes. In the book he states that, "if you ask anyone wearing Toms how they first heard about us, most won't mention an advertisement; they'll say a friend told them our story." For me, this is exactly why I was so excited to participate in #feedthedeed. I had read the story of those two guys from Toronto and I thought about participating, but it wasn't until I started reading my friends' personal stories that I felt completely compelled to participate. What's even cooler is that I wasn't the only one reading these stories; my daughter, Maya, was just as riveted as I and confessed that she was really hoping someone would nominate her. We promised each other that if one of us got nominated, she would #feedthedeed to the other. Finally, my day came. And even though I'd been planning for it, when I was finally faced with that 24 hour deadline, I couldn't decide what to do. It wasn't that I couldn't think of anything; it was that I couldn't think of anything that I felt confident I could accomplish in the few free moments I could scrape together. But then I thought back to the deeds I'd seen that made people the happiest and realized that it really was those small -yet personal- gestures that made the recipients the happiest. With that in mind, I came up with a plan: since it was supposed to be yet another insanely frigid day, Maya and I were going to bring hot chocolates to people waiting for their morning bus. 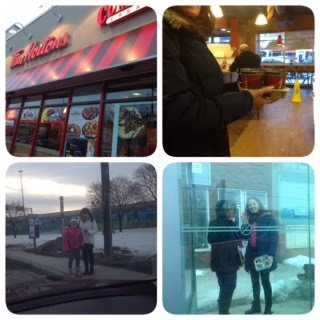 The next day, we got up extra early, bundled up, and headed out to Tim Hortons. We got our hot chocolates, got back in the car, and got ready to give...all we needed now were customers. The first stop looked perfect; the three people standing there had been standing there since before we got to Timmy's; for sure they were freezing now. Fortunately for them (but unfortunately for us) their bus got there seconds before us. Our next customer stopped us before we could say at word; saying thank you but that he didn't drink coffee. We told him it was hot chocolate and he said he didn't drink that either. We felt a bit defeated but at least we made him smile. After lots more tries and a growing feeling of defeat, we finally had our first taker*. I'm not sure whose smile was bigger: the hot chocolate giver or receiver. After that it was smooth sailing and we gave away the final three. On our way home, I thought about how happy I felt and about how much fun I had. But why? It certainly wasn't the waking up early, or the rejection from wary people, or constant getting in-and-out of the car at bus stops and getting a blast of polar vortex-fueled cold air in the face and hearing impatient honking behind me. It was because despite all of that, the look of sheer joy and happiness on people's faces when they got their hot chocolate was just...amazing. It feels so good to make people happy. As soon as I possibly could, I uploaded my images, shared my experience, and nominated the next round of deed-doers, one of which was of course Maya. A small part of me was envious of them, knowing what they were about to experience. So what should I do? How do you think I should #FeedTheDeed? *Who could turn down hot chocolate served by the cutest little girl in a pink cupcake hat?